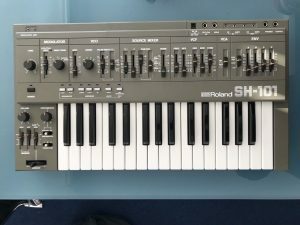 “I am reluctantly selling my Roland SH101 from 1983 – All genuine, I have owned this one from new. …I purchased it from ‘Future Music’ in Chelmsford (no longer trading) and still have the receipt to prove it. So it’s a 1 owner since new item. This unit is 35 years old and has been extremely well looked after. It has never been gigged and has had light studio use only (smoke free environment). For its age, it is in very good condition with every conceivable feature working as originally intended. It has recently been serviced / calibrated, So its ready to perform like new. Cosmetically (for it’s age) the unit looks stunning, there are no broken keys or missing sliders, everything is where it should be. The case itself has no cracks or chips, however the ‘grey colour’ has changed slightly over the years from I guess, UV light exposure (…this of course does not affect the audio performance whatsoever).